You are here: Home / Honda / Honda Express, Spares, Repair, Or A Winter Project!!. 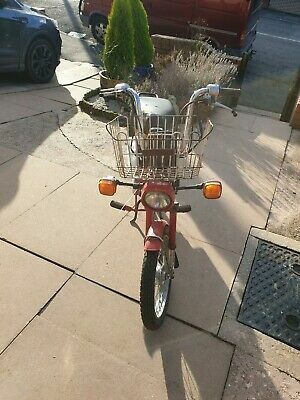 Honda Express, Spares, Repair, Or A Winter Project!!. PLEASE READ OUR TERMS AND CONDITIONS!! PLEASE NOTE THAT THIS ITEM IS PAYMENT BY CASH ONLY PLEASE!!.. ON PICKUP!!.. NO PAYMENT WILL BE TAKEN THROUGH PAYPAL.. THANK YOU!!. A lovely Project for you to do throughout the cold nights!!.. Ready for the summer day’s ? ITEM IS COLLECTION IN PERSON ONLY PLEASE!!.. AN AS STATED ABOVE!!.. THIS ITEM IS PAYMENT BY CASH ONLY PLEASE!!.. ON PICKUP!!.. NO PAYMENT WILL BE TAKEN THROUGH PAYPAL.. THANK YOU!!. SORRY BUT WE DO NOT POST!! Thank You For Looking ? This Honda Express, Spares, Repair, Or A Winter Project!!. is located in Dudley, DY1 3LR and is being sold on eBay by wilant3.